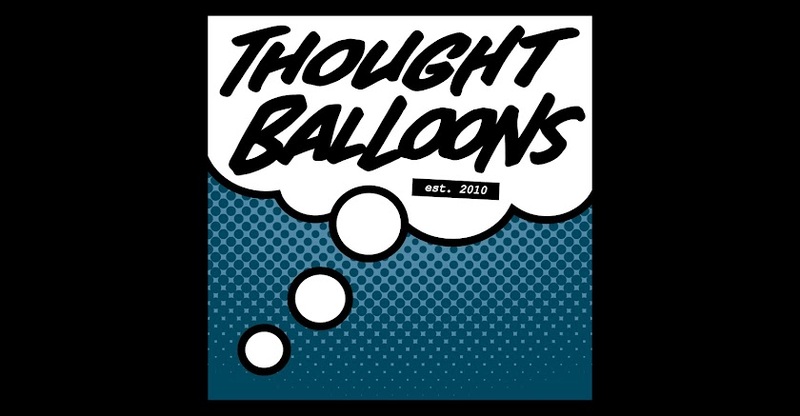 Thought Balloons - Creating Comics One Page At A Time: Why the Pet Avengers? Because the Avengers were busy. I'm picking the Pet Avengers because comics are supposed to be fun, and that's exactly what the Pet Avengers are. In theory, the Pet Avengers are completely ridiculous. And frankly, in practice, they're still pretty ridiculous. But that's a big part of their charm. Where else will you find a teleporting dog, a Mjolnir-wielding frog, a fire-breathing dragon, a heroic falcon, a sabre-tooth tiger, a telekinetic fielded cat, and a second, non-teleporting, regular dog? And all on the same team to boot? I'm going to go with “nowhere else”. 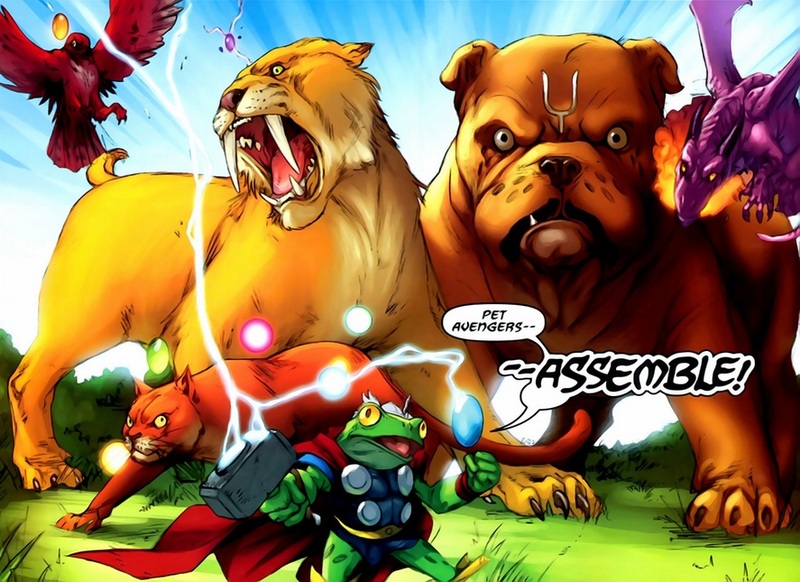 I first came into contact with the Pet Avengers while reading Alex Zalben's fantastic Thor and the Warriors Four. While these amazing animals were confined to a cameo role, I immediately fell in love with. To be honest, I rushed to my local comic book store to find what else this team of super pet has been in. There wasn't a ton at the time (although there have been a few series since then), but it was all a joy to read. These aren't necessarily the most intellectually challenging books you'll ever encounter, but darn if they don't make for some darn good reading nonetheless. Each character has their own distinct personality, and like any team book worth its salt, their sum is very much greater than their individual parts. Seriously, if you haven't encountered these craft critters before, you have been missing out. So in the interest of adding a bit more Pet Avenger goodness to the world, let's do our part and whip up a few more fun stories for these endearing animals to star in. Nothing too heavy. I just had fun with this one. A MEDIUM CLOSE up on LOCKJAW, staring into CAMERA. REDWING perches on his head. CAPTION: The Fantastic Four and Doctor Doom. CUT TO a TIGHT SHOT on THROG as he twirls his hammer, ready for action. CUT TO A TIGHT SHOT on HAIRBALL, back arched and hairs rising. CUT TO A CLOSE UP on MS. LION, her teeth bared. CAPTION: You get the idea. CUT TO ZABU walking towards the CAMERA, head bowed and ready to pounce. LOCKHEED hovers behind him slightly. CAPTION: Every hero has their nemesis. CUT TO a WIDE PANEL. In the foreground of the panel we can see the silhouettes of the Pet Avengers, their backs to us. They're looking across a patch of grass (somewhere in Central Park) towards their counterparts: THE PETS OF EVIL. This diabolical team consists of: one of the BEASTS OF BERLIN (a super intelligent gorilla created by communist scientists), ELENDIL the hell-horse (steed of the super-villain the Dreadknight), DROOG (a triceratops looking creature and pet of the Hulk villain The Gremlin), PREYY (a fearsome looking leopard owned by Killmonger), TOVARISH (one of Kraven's wildcats--yes I totally made this one up), IGOR the baboon (one of the Red Ghost's Super-Apes) and MODOG (Mental Organism Designed Only for Growling-- yes I'm aware there's already a MODOG of sorts but that one isn't a pug with a huge head in a tiny little hover chair that I also just made up). CAPTION: Even the furry ones. PET AVENGERS (ALL): Pet Avengers-- Assemble! @Dan - Love it. 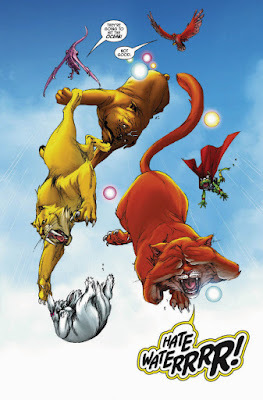 This is the kind of fun that the Pet Avengers are virtually made to embody. The development from pseudo-serious to evident playfulness builds quite well, and it's a cute little point to build a script around. One thing to note: Ms. Lion is not actually a female dog. Despite the name, he is all man, something that I've always found to be hilarious. @Dan: Dag nabbit, you used my idea! Good thing I already got a version into the que, or else I'd have to work on a new one. @Dan - PETS OF EVIL. Golden. The page builds well, feels like a tentpole movie trailer, and delivers at the end. Love it. @Grant. You can tell I never read the comic, right? Heh. @MK: To be honest I thought at least one other person would have a similar idea. Looking forward to seeing what you've come up with!